Can I have a fire? What happens if it rains? Find out here. The FAQs below cover questions relating in a general sense to any of our canoe and kayak tours. Each tour will of course have its own particular set of considerations. Detailed information on your chosen tour, including a list of FAQs relevant to the experience you have chosen, recommended packing list, etc, will be included in booking documentation. Will I be told where to camp? Can I camp wild? How much storage space is there in a canoe or kayak and how should I pack my belongings? How should I store food and other things I need to keep dry? Are dry bags provided? Can I store luggage I don't need during the tour at the canoe or kayak centre? How do I go to the toilet? 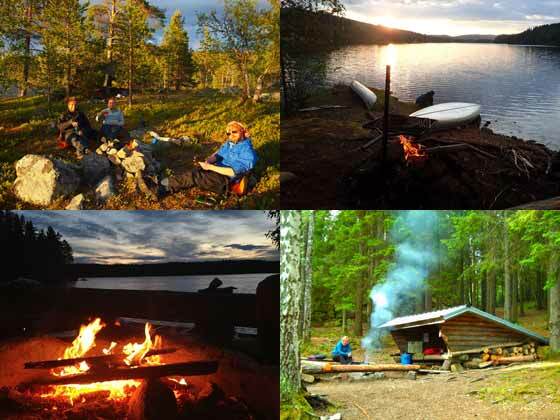 The opportunity to have a camp fire is a great attraction for many guests paddling in the Nordic countries and all our canoe and kayak tours offers this possibility. Depending on the tour chosen and the area in which you are paddling, arrangements and possibilities will vary. You should also make yourself aware of latest information regarding any fire bans in place and the regulations relevant to the particular area in which you plan to paddle at the start of your experience. In areas where camping is at designated locations, fires must only be made at these locations using the fireplaces provided. For tours in Rogen, you are welcome to camp outside the designated spots, but fires are only permitted at the designated locations. In other areas, camp fires may be permitted outside designated areas. Please see information for your chosen tour for details. Again, special restrictions will apply to protected areas such as nature reserves and national parks. During very dry periods when there is a high risk of forest fire, there may be local fire restrictions in place and fires will be competely prohibited. A fire ban must be observed without exception. Observe any local or temporary restrictions regarding the lighting of fires. During particularly dry conditions when there is a high risk of forest fires, local restrictions may be imposed prohibiting the lighting of fires. Check notices and local information for the latest situation. Certain protected areas such as national parks and nature reserves may also have their own rules regarding the lighting of fires and use of forest resources. Choose a suitable place for your fire, with a base of gravel or sand. It should also have easy access to water in case you need to put the fire out quickly. Check the wind strength and direction – sparks can carry some way and ignite the surrounding forest or grassland. You should not light your fire on a bed of peat or moss, which burn very easily. Peat fires can smoulder and burn underground for a very long time, and may still be burning below ground level even when the fire seems to be out from above. Similarly, you should avoid lighting your fire in any earthy, forested area. You should also avoid lighting your fire near to anthills or old tree stumps, both of which may catch fire very easily. Do not build large bonfires – this is a waste of resources and extremely dangerous. Keep your fire small, focused and controlled (this also makes it much better for cooking on if you are planning to make food on your fire). Dig a shallow hole in which to make your fire or make a circle of stones around the fire to contain it. Do not use wet stones, which can crack and explode when heated. Also, do not light your fire on or next to flat rocks. This chars and may crack the rock and looks very unsightly, and the marks will remain for a very long time. If there is a strong wind, do not light a camp fire. Do not burn rubbish of any kind on your fire. Even cardboard and paper is difficult to burn completely and will leave an unsightly residue. Burning paper can be carried into the surrounding trees by small gusts of wind. Do not try to burn plastic or food waste. Please take everything with you and dispose of it correctly. When collecting fuel for your fire, unless the area in which you are travelling has its own special regulations, it is permitted to use small branches, twigs and pine cones which are lying on the ground. Bear in mind that dead wood provides an extremely valuable habitat for a wide range of species – more species of insect can be supported by dead wood than live wood – so avoid larger branches and stumps. Just because they are no longer on the tree, doesn’t mean that they are not still extremely important to the local ecology! You must not take any material from live trees or damage them in any way. Do not leave the campsite before the fire is completely extinguished – it must burn down completely before you leave. Use water (use much more water than you think you need) to put the fire out, then poke it to extinguish any embers. Use a small trowel to dig up the earth under the fire to ensure there are no embers or smoke remaining. If you can, call the fire brigade immediately. In Sweden, Finland and Norway, the number is 112. It is important to stop the fire spreading in the direction of the wind. Take some bunches of branches from pine or juniper trees (these are better than leafy branches). Wet the branches if possible. Use the branches to sweep the burning pieces towards the fire while pressing the branches against the ground to put out the flames. Clear brushwood and twigs out of the way and remove moss from the path of the fire. DO NOT beat at the fire with large strokes, as this will spread sparks. Get down on the ground and roll over and over. If someone else's clothes catch fire, lay the person on the ground and smother the flames with a blanket or jacket. Protect their face by covering from the head downwards. Bear in mind that some fabrics, e.g. nylon, can catch fire and melt and may increase the risk of injury. Use cold water to cool burning clothes and soothe burn injuries. If clothes are stuck to the skin, do not try to remove them. You should keep affected skin in cold water for at least 10 minutes. 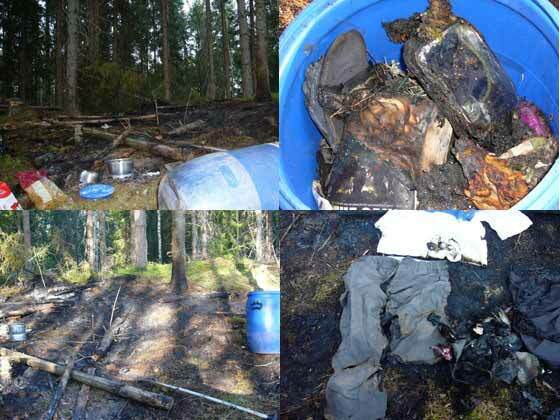 You should never have an open fire or any glowing coals inside or near your tent. Have a knife to hand to cut your way out in case of emergency. If using a camping stove, wait until any unused fuel and utensils are cool before packing the stove away, pouring the fuel back into the bottle, or topping up a stove with new fuel. A camp fire on a long Nordic summer evening (or a short winter one if you're winter camping!) is a wonderful experience. If you follow the simple guidelines above when collecting your fuel and lighting your fires, you will be able to enjoy your fire safely and ensure a supply of fuel and a pristine environment for those who come after you. The simple answer is...you get wet! We hope of course that you will have good weather during your trip, but as with any outdoor experience, it is important to be prepared for a range of temperatures and weather conditions during your tour, whatever time during the season you choose to travel. Many of our canoe and kayak experiences are self-guided and entail a certain degree of self-reliance and independence in the outdoors. 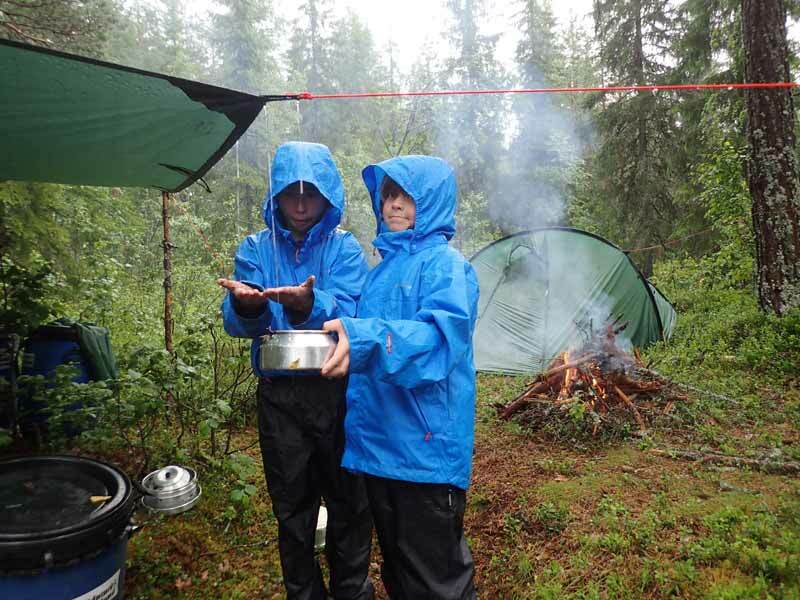 Dealing with and adapting to different weather conditions is an integral part of any outdoor activity. If you do experience bad weather during your tour, be prepared to be flexible. For example, take a deck of cards or good book so that you can wait out a day of bad weather, or choose to go for a hike on land that day until conditions improve. You may then need to cover additional distance on another day of your tour if you need to reach an end point at a specified time. Be prepared to vary your planned route and distance covered depending on the conditions encountered. Note that if you choose to abandon your tour due to bad weather, no refund can be offered for unused time and, depending on the nature of the tour you have chosen (for example if a custom transfer must be arranged for collection outside standard times), this may incur additional charges locally and custom transfers may not always be available at the desired time. We recommend that you plan your tour on the assumption that you will make the best of any conditions encountered and get as much as possible out of the experience in the time available, rather than considering finishing early. However, arrangements can of course be made when absolutely necessary and you should not hesitate to contact the canoe or kayak centre during your trip if you have any concerns or feel that you are unable or do not wish to continue. 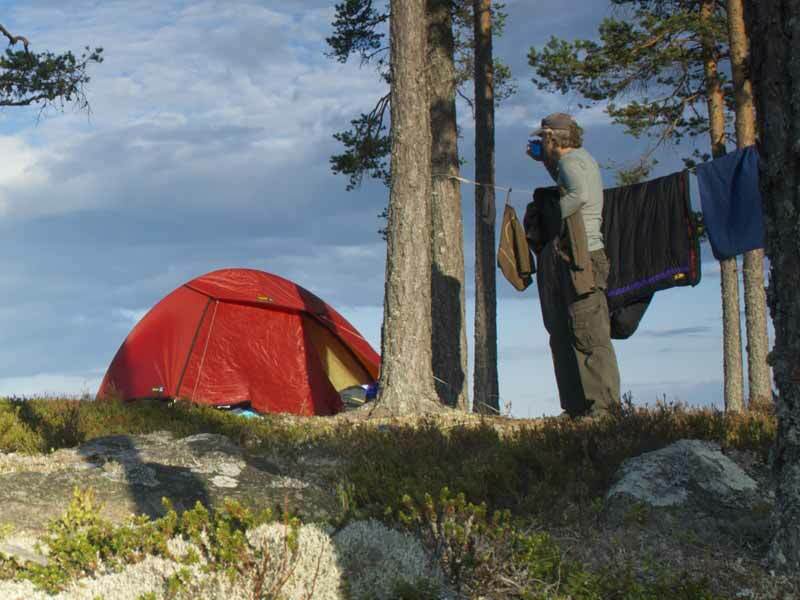 In some areas (such as for our canoe tours in Värmland in Sweden or kayak tours in the Swedish archipelago areas), camping is fully wild within the guidelines of the Swedish Right of Public Access, on which information will be included in your tour documentation (you can also read more in our FAQs on this topic). You will not be told where to camp. Suggestions of suitable spots may in some cases be given, but it is an important part of limiting impact on the local environment that guests camp at a range of locations and searching for and finding "your" perfect spot is very much of the experience. In other areas (such as Dalsland in Sweden or for tours in Finland), there is a network of designated camping locations in the area. You must camp at these but are free to choose which ones from those in the area in which you are paddling. 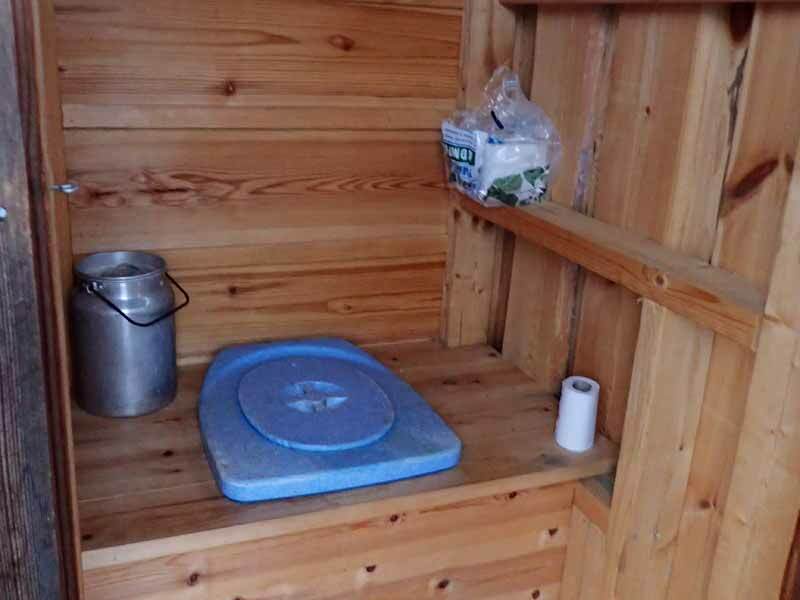 Depending on the area and the tour, in many cases, the designated locations will have fireplaces, sometimes with wood provided, and will often have a dry wilderness toilet. While you may of course meet other paddlers at these locations (depending on the tour chosen and what time in the season you are paddling), this offers a very convenient infrastructure framework for your tour and also limits the impact on the local environment. In all cases, Rights of Public Access apply differently to groups. If travelling as part of a large group, you may be asked to camp at specific locations which are suitable for your group size. Protected areas such as nature reserves and national parks, or other areas during bird nesting seasons, may also have particular restrictions. The exact size of the canoes/kayaks provided will vary to some extent depending on the tour chosen and also on the particular models provided to you. 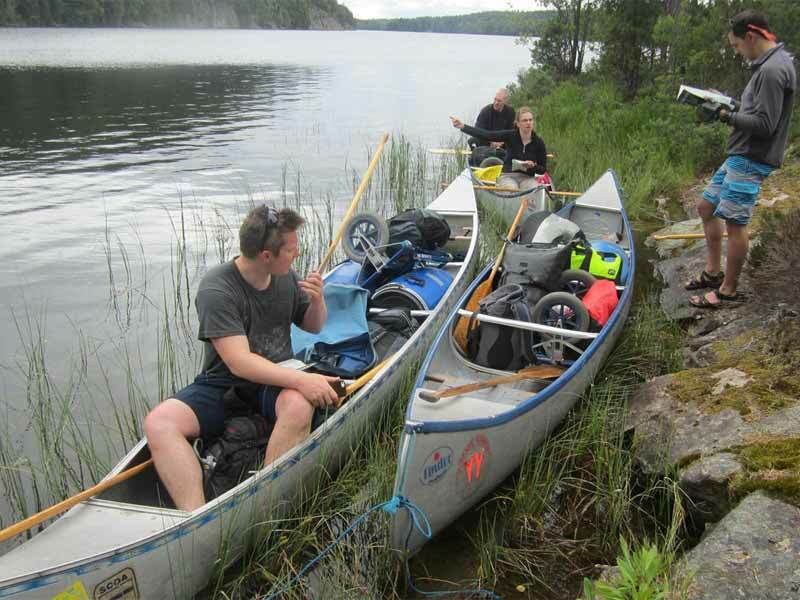 A 2-3 person Canadian canoe typically has ample space for 2 adults + 2 rucksacks and a pack barrel (which may be provided as part of your tour equipment depending on the tour chosen), plus additional items such as a canoe trolley (again, if appropriate for your tour), water container, etc. If paddling as 3 persons in one canoe, packing space will of course be more limited. When travelling as a larger odd-numbered group (e.g. 5 or 7 persons), some of the luggage from the 3-person canoe can be carried in the other canoes. For tours requiring land transports, when using a canoe trolley you will need to take heavy items such as rucksacks out of the canoe, while for tours such as those in Rogen where a trolley cannot be used and the canoe must be carried, you must take all items out of the canoe during transports. You should therefore if possible plan to have all your personal items in a single backpack per person that can be easily carried during land transports. Single kayaks (K1s) offer around 150 litres of total storage space, while double kayaks (K2s) have around 200 litres. Luggage and other items should be packed in soft, waterproof bags - storage space in kayaks is more limited than in canoes and it is not possible to fit larger rucksacks or bags with rigid frames. However, provided you pack sensibly in accordance with the recommended packing lists, you should find that you have ample space for your tour. Depending on the tour, waterproof pack barrels and/or waterproof bags may be provided. These can be used to keep some of your items dry (for example, pack barrels are ideal for storing food or bulky gear such as sleeping bags). Kayaks have compartments which are watertight when sealed properly, but not intended to be completely free from water getting in - you should pack your belongings inside their own waterproof bags and take particular care with sensitive items such as cameras. In addition to any containers/bags provided as part of your tour equipment, you should bring additional waterproof bags for storing other items. These are available at low cost from any outdoor store, but plastic carrier bags, ziplock freezer bags or bin bags can also be useful - for example, large garden bags can be ideal to cover items such as rucksacks. These "budget" alternatives will provide good protection against the weather, but of course will not protect your gear from getting wet if you drop it in the water - for that a "proper" waterproof bag is necessary! When canoeing, a tarpaulin can also be useful to secure luggage in the canoe and protect it from rain and paddle splashes. No refrigeration is of course available when on a tour and in most cases it will not be suitable to bring cool boxes, etc. You should plan your provisions accordingly to include non-perishable items. Products such as milk or butter can be kept cool by being stored in the water (anchored securely of course) when camping overnight. Yes*, you are welcome to leave any items not needed during your tour at the canoe/kayak centre to collect at the end of your trip. 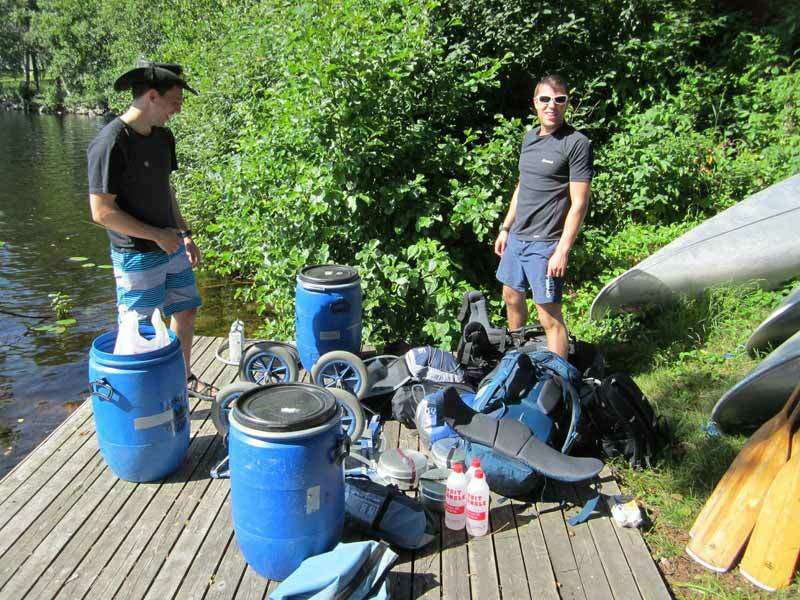 *For Stockholm Lakeland Canoe Explorer, where tour luggage is transported between overnight locations, you should arrange to leave items not needed during the tour in Stockholm. Some areas (especially those in areas with designated camping locations) may have dry outside wilderness toilets. For solid waste, you should use these where possible, but for liquid waste (except when a large number of persons use the same area) it is better to do your toilet in the wild. If one is not provided as part of your tour equipment, it is very important to bring a trowel or small spade for burying toilet waste. Make sure that you choose a site well away from camp and any water sources to go to the toilet (for faeces, you should move at least 60m away). Using your toilet spade, dig a hole at least 15-20cm deep. When you have finished, it is helpful to use a stick to mix in some earth to help the decomposition process, which acts very slowly in northern areas. Ensure that the hole is well-covered with earth and vegetation. Leave no trace - no-one else should be able to see where you have been. Make sure you do not leave any loose toilet paper, etc. Do not burn toilet paper as this may cause a fire. You must pack any non-degradable products such as female sanitary items out with you.